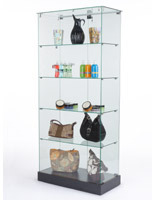 This Free Standing Display Case is Stocked for Quick Shipments! Trophy Showcases are Our Specialty, with 100s In this Online Catalog! 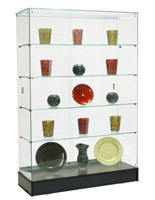 Each Free Standing Display Case is Affordably Priced! 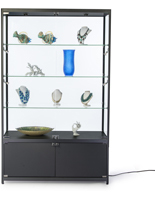 A free standing display case, such as the one seen here, features a high-end design for hundreds less than comparable models. This wall showcase boasts a high-end, frameless design. A frameless glass fixture, free standing display case that displays retail goods enables store patrons to view displayed merchandise from any angle, without aluminum extruded edges blocking their view. Bulky extrusion has become a thing of the past, with more retailers looking for clean lines and a more minimalistic approach for their jewelry showcases. 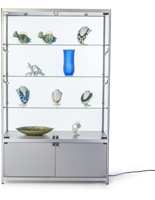 Small metal connectors hold the glass panels together, letting the focus remain on the displayed goods for sale within your free standing display case. Such glass fixtures often display a trophy collection within a school, jewelry within a retail store, or even high-end collectibles in a specialty shop. 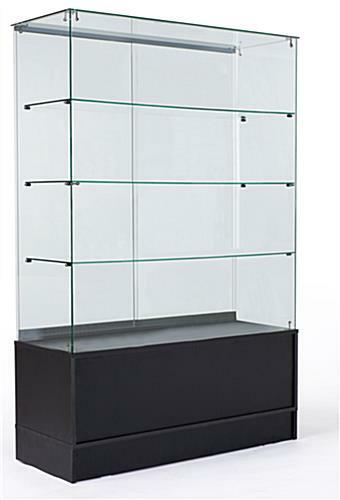 The frameless design of each free standing display case provides a European-like appearance, yet each trophy showcase is sold at a fraction of the cost of comparable European-made models! The price of this floor-standing glass fixture can't be beat! 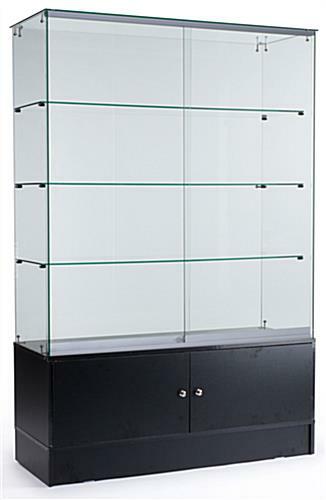 Each free standing display case, that is frameless, also boasts sliding glass doors with a locking mechanism to protect displayed trophies and awards. The trophy showcase comes with a set of keys, ensuring that only store clerks have access to the displayed goods. 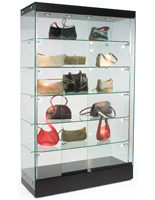 This is also a free standing display case that includes a locking base cabinet. 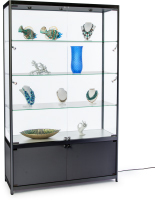 This storage area is ideal for jewelry stores, or trophy retailers, as additional merchandise can be placed in this secure cabinet for display replenishment. The storage cabinet features two locking hinged doors for easy access. 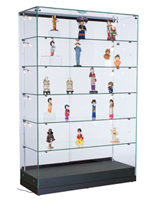 Additional security features of this free standing display case include tempered glass panels. This type of material is safer for use in public settings. 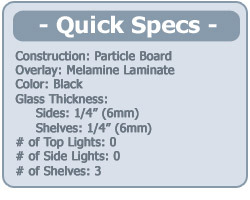 If and when tempered glass breaks, it will yield smaller, more manageable pieces than standard annealed glass fixtures. 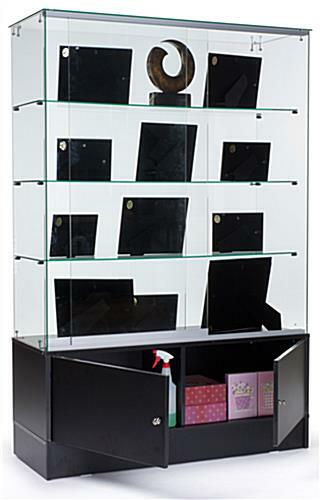 This is a DIY free standing display case, to save merchants money in shipping costs. Each glass trophy showcase ships unassembled. Assembly is quite simple, for such a large wall showcase. Step-by-step instructions, as well as an instructional video, are provided for your convenience. Unit was easy to assemble and my wife uses it to display her Lego buildings. Satisfied with the quality of the unit although there is no flexibility regarding the shelf placement and adjustability.